musebook tuner v2.20 and metronome v1.20 are back with enhanced features that is more useful way for your musical activity. Registered users are encouraged to update the current version FOR FREE! 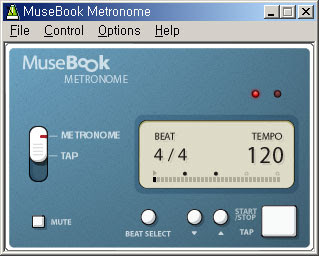 These new versions of both musebook tuner and musebook metronome feature Always On Top function. Disabling Screensaver function has been added requested by many instrument players. That way they do not need to move a mouse while they are practicing with musebook tuner. Your screen saver is disabled for 5 minutes under Chromatic and Manual Mode, after sound input from microphone (Only if musebook tuner window is activated). We believe that these new versions will give you more fun and stable environment. musebook wav2midi converts monophonic (44.1 KHz 16 bit mono) Wave file to MIDI file. 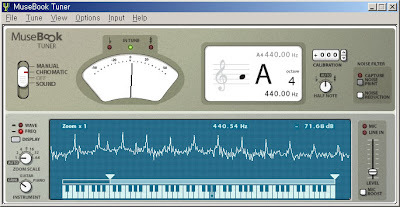 It analyzes Wave file and detects pitch, onset, diminution and timbre of sound and produces the REALISTIC MIDI FILE. WAV2MIDI conversion is EASY and BETTER! With MuseBook Wav2Midi, you don't need complex setting. MuseBook Wav2Midi converts the file sequentially and saves them in designated folder automatically. You can change the MIDI voice after conversion. Wave File Format : 44.1KHz 16bit mono(not stereo) wave file contains monophonic(not polyphonic) sound (not polyphonic).